GPS, GMO’s, Corporate Co-ops; these are words that are heard all over the news. What do all these abbreviations have to do with our small town? Our town, and surrounding areas, are filled with the bounty that these amazing futuristic agricultural advancements have already improved. With Thanksgiving in the air, I thought that I would write about a good friend of mine whose job is to help farmers keep farming. Productive and profitable farms are harder and harder to maintain in our ever-changing economic landscape. 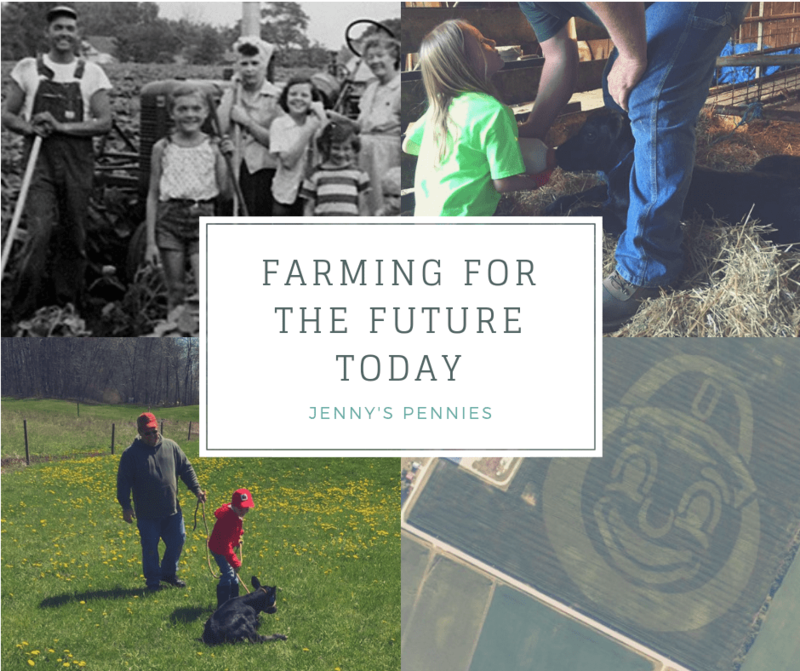 This edition of Jenny’s Pennies will focus on giving thanks to the technological advancements in agriculture, that will help communities like ours be able to sustain our way of life for years to come. First let’s start at the beginning. My good friend Mike Gardner is a third-generation farmer who grew up on a 60-cow dairy outside of Ellwood City. Mike is no stranger to hard work. He loves working with his hands and eagerly reaps the bounty that he sows in his backyard garden. Growing up Mike thought he would become a Mechanical Engineer. When he realized how much office and desk time that required, he shifted gears. After high school he attended Penn State University and studied Agricultural Systems Management and Technology. This degree made it clear to him that if he wanted to enjoy a career in agricultural for the long term, he needed to change some of his thinking. Current population estimates for the world are approximately 7.3 billion and by the year 2030 it is estimated that the world population will be over 8.5 billion. With fewer and fewer farms, more expensive equipment costs, and less land available for farming, how will the agricultural system keep up with the demand? Innovation, diversity, and consolidation are the key! Fewer and fewer American farmers are able to say that all of their income comes from farming. It is a hard reality for many to swallow. Younger generations are simply not continuing their family’s farms and their parents and grandparents can’t blame them. All you have to do is look at the dairy industry in our region to see how volatile the markets can be. So, what can be done to keep farming alive? Let’s get back to Mikes story. After college Mike traveled around and gained invaluable experiences for his agricultural resume. In Virginia, he worked at a 1000 head cow/calf beef operation. Later he moved to New Jersey to work at “Cedar Lane Farms” which was owned by James Johnson of the Johnson and Johnson Corporation. Cedar Lane gave him experience at a more diversified outfit where there were beef and dairy cattle, crop production, and even horse and carriage teams that would travel to the Olympics for competition. These experiences, along with others, encouraged him to really look into the future of agriculture to see what he would ultimately pursue for a long-term career. There were many challenges he saw for the future of agriculture in our area and beyond. The average age of the American farmer was growing older as the youth chose other career paths. Very few start up farms are able to survive as the cost of start up keeps increasing and the revenue continues to decrease. In New York Mike saw 1000 cow dairy farms shutting down due to decreased revenue from milk. Dairy farmers would literally begin to lose money every time they turned the barn lights on. The writing was on the wall that change had to happen. Large corporate co-ops and greater productivity were essential. I asked Mike what advice would he give youth who want to pursue a career in agriculture? He said, “You gotta love it. It’s a very rewarding career. In production agriculture you get to start a new crop or a new life, reap your rewards in the fall at harvest, doing your part to feed the world.” He also recommends that educationally they focus on computer software, Agricultural Engineering, Business Management, etc. Computers are the future of farming. The biggest roadblock to farming in his opinion is trying to stay profitable in a down market while also trying to maintain efficiency. The balancing act for farmers is never ending. With all this being said currently Mike works for Growmark FS as an Ag Technology and Sales Support Coordinator. His company is a dealer for Precision Planting Products and he specializes with the PP product line. Growmark FS as a company is a diversified corporation that deals with; retail sales of seed, plant nutrients, lime, crop protection materials, custom application, turf, propane, and precision planting. This company has about $275 million in annual sales, has approximately 300 employees, and has about 8000 customers. Mike gets to help producers use GPS guidance for their planting systems combined with computers and software that used to be non-existent. With the advent of GMO (genetically modified organisms) he is able to see round up ready seeds grow into healthy fields for his customers. When the consumers understand how advantageous these GMO crops can be, they realize that they are not some sort of Frankenstein experiment to fear. Without GMO crops, meeting the worlds food needs of the 2030 population estimates would be nearly impossible. Mike is amazed that through his job he is able to work with a farmer and actually help them make a living doing what they love. He never thought he would make a living working on corn planters, and yet here he is! Through Growmark Mike is able to be a High Yield Coach for his customers to help them be as profitable as possible. Most of his customers farm 500 acres or more, depending on the crop market. He is able to educate customers and the public about user friendly technology that can make real impacts on their incomes. His territory is from the Ohio line to Harrisburg and if you would like to get more information you can reach him by email at mgardner@growmarkfs.com. Mike truly enjoys his job, even the computer part! Deep down Mike loves farming and makes a conscience decision to make it a part of his everyday life. Not only does he have an amazing backyard garden, make amazing strawberry pie, and shares his abundant crops of corn, potatoes, etc. with his very thankful neighbors, he also is a one third partner in “Hidden Springs Farm” a beef cow/calf and grain operation of close to 400 acres. He not only walks the walk, he talks the talk. With his lifetime love of farming and knowledge of the real struggles that everyday farmers are dealing with, he can talk honestly and with relatable information to help them succeed doing what they love. So, with our Thanksgiving festivities, fall harvests, and thankfully full bellies, we should all remember to thank a farmer for the abundance on our tables! I suppose we should also thank a software developer, pilot, scientist, and of course my neighbor and friend Mike Gardner for sharing their talent and expertise with the world. I hope you have enjoyed this edition of Jenny’s Pennies, I know I have enjoyed writing it. Until next time, keep an eye out on the amazing community that hides in plain sight all around us. Maybe, if you look close enough when you drive down the road, you will see one of those computers hooked up to a local tractor and remember all that goes into making farming possible.